Paintbrushes. Your vital painting tools. Choose the best paintbrushes for you. Explore some possibilities you may not have considered. A quick trip to your local arts supplies shop will give you some insight into the range of paintbrushes available. There are brushes for applying paint, stippling paint, softening paint and even paintbrushes that promise all types of special effects. Some of them are very useful. Others (in my opinion) have much cheaper alternatives that will do the same thing. Particularly when painting with acrylics. The most important thing is, know the brushes that you use. Know them very very well. A different paintbrush is unlikely to save a bad painting. Good skill and technique should. A paintbrush is fundamentally something with which to scoop up paint, and apply it to a surface. It sounds simple enough. Not so when you actually sit down and work out the possibilities, and capabilities of each brush. It may seem as thought the handle is purely the bit that you hold - but that in itself is important. Shorter handles will fit into the palm of your hand, allowing for different paint application and movement. As a general rule though, most artists' paintbrush handles are quite long. These can be made out of timber, plastics or your annoying neighbour's shinbone (did I say that out loud??). This is the (generally metal) part that holds the bristles onto the handle. 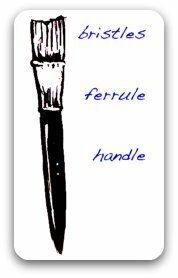 The shape of the ferrule, for example flat or round, will determine the shape that your brush forms. If a ferrule is not fitted properly you can have problems with bristles falling out, or even the whole ferrule falling off the handle. Usually at the least appropriate time. You would like to think that the more you spend, the better the quality. (Which is fine if you look after your brushes). Traditionally made from animal hair, although these days synthetic fibres have really come into their own. Even to the point where synthetic fibres have now been modified to replicate the qualities of animal hair. The bristles can be stiff or soft. The bristles can be formed into many different shapes which has a profound impact on the marks you are able to make. It seems that the price of brushes is more determined by the quality of the bristles than any other part. As an aside - I'm a firm believer in choosing the right brush for the right application. I am particularly rough with brushes, and I'm a little lazy when it comes to looking after them. So, expensive brushes are not really an option for me. I tend to use between 4 and 6 brushes, which cost me a total of approximately $5. The most important thing is that you know exactly what your brushes will do. Don't go searching for a new one to solve a problem, when you haven't fully investigated the possibilities of the ones you already have. How much do you want to spend? You can spend a stupid amount, upwards of $200 on a single sable hair brush. Or not. They'll do what you want (with a little practise). They're cheap enough to beat up. Dry brush technique is rough on brushes. Leaving brushes in water rots them. They lose hair - bash them up a bit first! They tend not to last as long. Quality can be inconsistent - a lot of variation. Sometimes the ferrule doesn't hold the bristles! Sometimes the ferrule falls off the handle. Bristles tend to splay a little sometimes. Not good for protection in a hurricane. 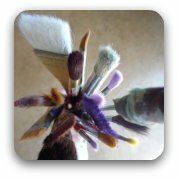 What is your arts practise (ie a watercolorist will need a completely different type of brush from many other artists)? Firstly, the amount of product you load your brush with. The bristles and size of your brush will determine this. A larger brush with relatively stiff bristles, will pick up a huge amount of paint. Obviously a small soft liner will need a lot of thinning agent in order for the brush to hold paint. Secondly, the amount of medium (e.g. water or specific medium) you add to your pigment. A softer brush will need the paint to be thinned in some way, in order to allow it to penetrate into the brush. Watercolour brushes are a case in point; as a good one will hold LOADS of paint. 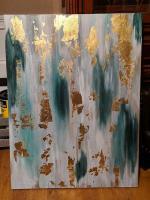 Softer bristles and thinned paint allows the paint to flow. This creates wonderful opportunities for you to create thinner and thicker lines, by adjusting the pressure. Lastly, the amount of pressure you apply. As a general rule, the more pressure - the less important the shape of the brush. A brush that narrows into a very fine point, will be profoundly affected the more pressure you add. In fact, you could argue the more pressure you apply, the less important the shape (in most cases). The stiffness of the bristles will probably be more noticeable than the shape, when you start applying more pressure. Spend some time experimenting with these three functions. 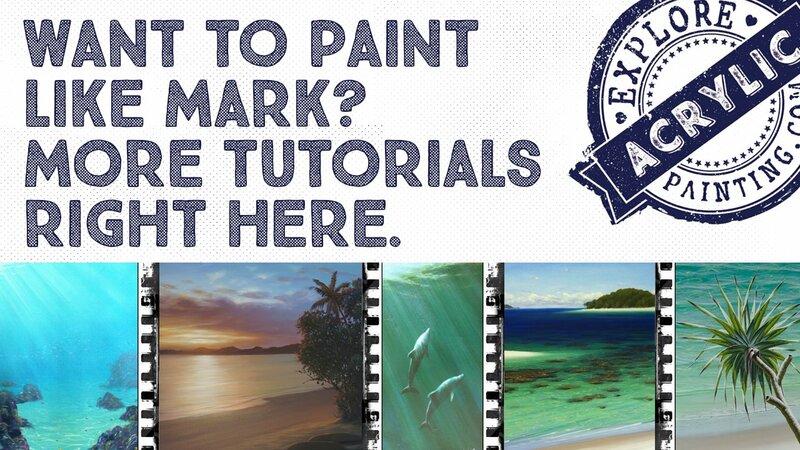 It will make you a better painter. I'm probably not the person who should be giving advice on this. But what I've heard you should do, is at the end of a painting session, rinse your brushes in warm water with a little bit of soap, and then rinse in cold clean water until the water runs clear. Lay flat to dry. (I leave mine in a bucket of water, and let gravity do the rest). Of course, I use them every day (that's my excuse and I'm sticking with it). IMPORTANT: Sounds obvious, I know, but don't leave paint on your brushes. I bring this up because you often have to clean a brush a lot more than you think to remove the product. If paint is left on the bristles, they will become stiff and will only be useful as weapons. EQUALLY IMPORTANT: Don't leave your brushes sitting in water (see above). Apart from stinking, they will also rot. And then smell even worse. You cannot imagine. It is quite incredible how disgusting that smell is. And can be often difficult to explain. Trust me, I am an expert on this one. Writing a page about paintbrushes, and keeping it relatively concise is not easy! We could fill pages. Hopefully though, this page if it hasn't been educational, has been mildly entertaining. That is in keeping with the whole philosophy of this site. Remember to have some fun! Drag out your paintbrushes, push them around and find out what they will really do. 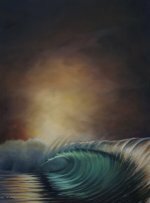 A profound knowledge of the brushes you have, will make learning to use any new ones, much easier. And for a bit of assist with brush technique, click here.